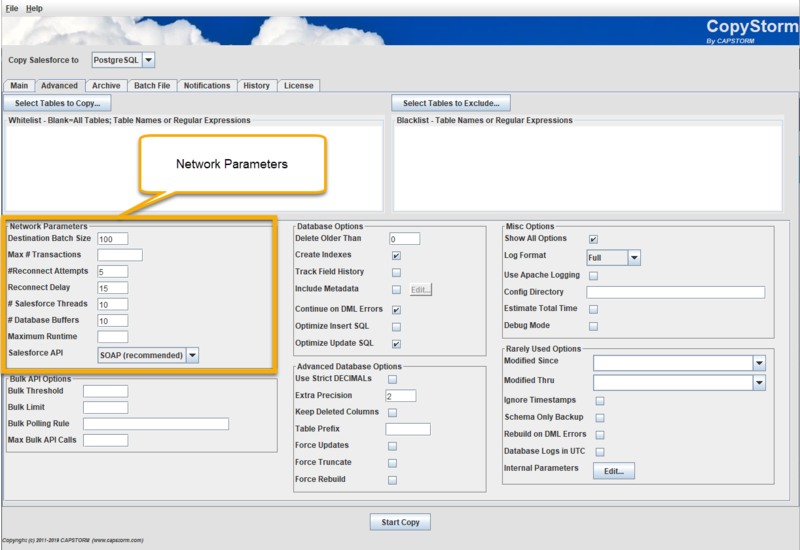 Network parameters are used to fine tune the connection with Salesforce. The default settings work well for most organizations. Destination Batch Size 200 Yes Limits the number of rows that will be written to the target database in a single batch. A smaller number minimizes memory requirements but increases run time. A larger value increases memory requirements and decreases run time. Max # Transactions No Limits the maximum number of transactions (queries) to send to Salesforce. This option can help avoid exceeding your organizational limit for transactions per 24-hour period. CopyStorm will stop when this value is exceeded. Usually this parameter is only set for the initial load of the CopyStorm database. #Reconnect Attempts 5 No The number of times to try to automatically reconnect with Salesforce if the connection to Salesforce has dropped. Reconnect Delay 60 No The number of seconds to wait between attempts to reconnect to Salesforce. # Salesforce Threads 3 No The number of tables that will be backed up at the same time by CopyStorm. Allowable values are 1-20 but many sites will see little benefit with a value greater than 10. NOTE: If you set this option to a high value, you will likely want to select “Apache/HttpClient” in the Main tab, because we have found Capstorm’s HTTP connection pool implementation based on the Apache libraries is more reliable than Salesforce’s WSC transport layer when hitting Salesforce with a lot of connections at the same time. # Database Buffers 10 No Sets the number of output buffers to use when running in multi-thread mode. A larger value increases memory requirements but allows Salesforce to read more records before they are written to the target database. Maximum Runtime No The maximum number of minutes CopyStorm will run before gracefully shutting down. Leave this blank to disable the time limit. Salesforce API SOAP Yes Choose the default API to use for talking with Salesforce. In our experience the SOAP API is almost always faster but REST may be selected as an option. Note that CopyStorm will, by default, use REST of any table containing a BASE64 column because this minimizes memory usage for most databases. Common BASE64 tables include Attachment and ContentVersion.